At this time, Image Magic does not offer any sort of layaway or COD (CASH ON DELIVERY) service. or Fax (03- 2032 4324) the bank in slip to us by stated the order number. * Image Magic uses prepaid system, an order will be proceed once the payment is made. * Please be aware that the processing of your order(s) will only start after the receipt of the payment in our bank account. For Giro Interbank Fund Transfer, fund availability is next working day. Please use Instant Interbank Fund Transfer to avoid any delay of your order. * Members overpaid for less than RM 10.00 will be forfeited automatically and is not refundable. The overpaid amount cannot be used for next order too. * Order status will be updated once we received the payment. Members can print out the Tax Invoice and Receipt from the ordering status page. 2) Paying by Cheque, order will be proceed upon clearing of the cheque. * Please be aware that we will not begin production until we have received the payment. As we have no influence on the posting systems and processing time of the banks, this may take up to 2 working days (excluding Saturday, Sunday and holidays). 3) Paying with valid Credit Card, once select Nbepay, our system will direct you into the netbuilder website. * You can choose between the following payment methods, eg Visa / Master card, Paypal or Debit Card and pay quikly, securely and conveniently. Please request a credit card payment link from our customer service if necessary. Our customer service will send the online creadit card payment link to you by email. Key in all the details and select the mode of payment that suit you. Once payment confirm , it will indicate it is successfully transfer. The web will bring you back to our webpage. 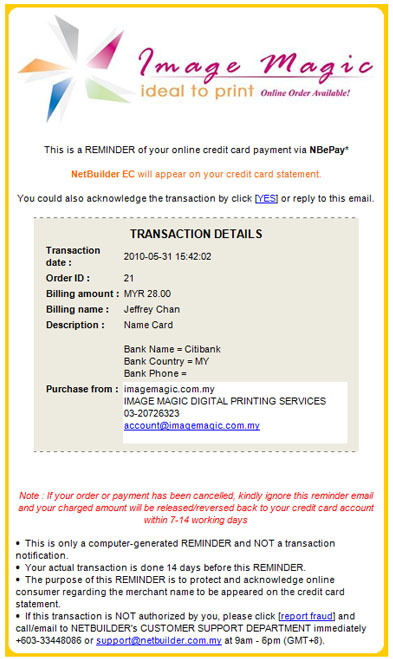 You will receive a notification in your email from netbuilder indicating you have made a payment to Image Magic Digital Printing Services. We use as our payment gateway. They are highly recommended in Malaysia as the most secure payment gateway. That is why you are save and secure when you are making payment to us.